It’s been a while since I’ve run more than 10 miles on two days during the week, not including the long run on the weekend. Wiley and Geezer have been at this for a while and are both in the 70 miles a week range while I’m still at 45 this week (hopefully) and their comments about 10 mile runs seeming like short easy runs is starting to make some sense now. One of the things that will be interesting for me is the 5 mile a week increase till I hit 70 and then trying to keep that level for 4 weeks until we get out of the Lydiard phase. With steady state runs (Karen has a good description) starting next week it’ll be interesting to see how my body reacts to the slightly increased effort and mileage together. Need to make sure food, rest, stretching and strength training are handled well during this time. And then when we get out of this base phase and start with more tempo and faster work while trying to keep the milage up will be a true test, that’ll be when some fine tuning and adjustment in milage will likely come into play. Today’s 12 mile run felt good, it was a little cooler and as the sun comes out the humdity tends to come down a bit. The work done on the trail is impressive, you still have the rocky true trail for the die hards and nice concrete paved portions to make the way from Town Lake all the way up to Shoal Creek and 38th. If you haven’t run it Wiley has a link to a writeup on the trail. We had a team meeting for Team Rogue after our run this morning. People ran between 14 and 20 miles today, 20 for the people that started in their Lydiard phase earlier. This is two weeks into the official program. Steve, Karen and Ruth (the coaches) shared an overview of the training and also some of the cool perks of being part of Team Rogue … I just like the sound of that … Team Rogue. Steve started us off by having everybody share their name, coach, goal time and race. It was interesting to see the different goals for all the marathon runners. The majority of people were of course training for the California International Marathon, which will be fun since that’s going to be a huge group of Austin runners going for that Marathon. There were people trying to run a 2:30 to 3:59:59 so it’ll be a fun tie over the next 22 weeks. Having trained with Rogue for going on 4 years I’m always impressed with how Steve can people excited about their training, their goals and to believe they can do it … as long as they focus and stay committed. 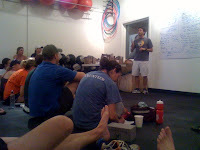 One of the exciting things about this new program was the new approach Steve is having us take for this training season based on his experience training over the last few years and his running and reading about running since he was 6 … that blows my mind sometime, running since he was 6. Steve shared the standard info about the impact of Aerobic and Anaerobic conditioning, the thing that was really different from previous programs is that for this group Steve is focusing a lot on the Lydiard model. Other Rogue programs and most marathon programs have a lot of multi-pace training, this time round we’re starting with a 14 week base Lydiard base phase and will have some interesting runs planned including 30 mile runs and some interesting 25 mile runs with miles all out mixed in. I’m definitely looking forward to the challenge. There are definitely some cool perks to being part of the Team Rogue program. Karen has arranged a block of rooms at a hotel for us take advantage of, I think we should rename it Hotel Rogue for the weekend! We’ll be able to take advantage of the yoga classes at the Rogue Annex next to the Rogue Equipment running store. We’ll be able to purchase, for a really good price, 2 sets of uniforms. Better yet we’ll get to vote on the colors. Now I have to say usually the Rogue gear looks pretty cool so our votes better live up to the past coolness of Rogue gear. Strength training with Mark at South Congress Gym. All in all I’m genuinely excited about this new marathon training program. Now I need to think about sucking it up and running the marathon with everybody instead of running a half … let’s see how that internal struggle goes.